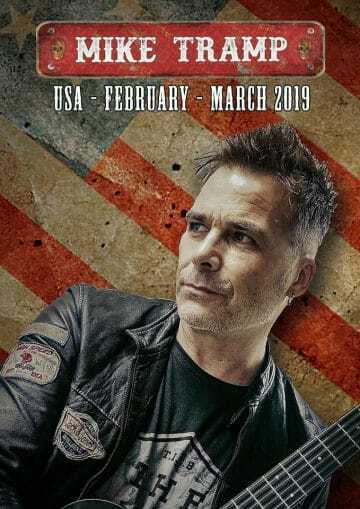 Former White Lion frontman Mike Tramp will be touring in North America in February and March 2019 behind his upcoming new solo album Stray From The Flock, which is to be released via Mighty Music on March 1, 2019. Sleaze Roxx stated the following in its review of Tramp‘s show in Toronto, Ontario, Canada back in late May 2015: “It felt weird hearing all of the White Lion tracks being played acoustically. I think that some worked better than others. Two of White Lion‘s most popular tracks, “Wait” and “Radar Love”, were fun to hear acoustically but paled in comparison to the original White Lion versions of those songs. Just before the guitar solo portion of “Wait” and while still playing that song, Tramp even warned the audience that he could not replicate the solo from White Lion‘s guitarist Vito Bratta so we just had to imagine it or something like that! My favorite tracks played by Tramp were therefore not the ones that I thought they would be. Out of the White Lion tracks, I really enjoyed “Little Fighter”, “Cry Freedom” and “Lady Of the Valley”. I also really enjoyed two tracks that I had never heard before which were the aptly named “Hymn For Ronnie” — Tramp‘s tribute song to the late Ronnie James Dio — and the Freak Of Nature track “What Am I”.